So… what was it for you? Divorce? Addiction? Family tragidy? What derailed your destiny? For Terah it was the failure to protect his own son. We don’t know why Haran died exactly but he died in the presence of his father. It would appear that Terah recovered from what must have felt like the epic failure of his life. Now it doesn’t say that he heard from The Lord but we do know it ran in the family. Just look at the lives of Abraham, Isaac and Jacob. So by some unction, he gathers up his family and sets out for the promise land. Along the way he comes to a place that memoralizes the greatest failure of his life. How must that have felt? He’s moving on with his life. He’s taking his family to a better place. Then out of nowhere he’s slapped right in the face by his past. We can only imagine how devastating that must have been. Imagine how disqualified he must have felt. Because of this he never stepped into the destiny on his life. He settled and went on to die in a place tied to his past. The good news is that the enemy has no power to affect the plans of God. The enemy doesn’t even have the power to affect you. We choose how our failures affect us. All the plans of God will come to pass whether by you or your children or another. The destiny was fulfilled by Abraham, but how different could life have been for Terah, if he would have overcome that hurdle? All of us once believed that we would do great things. Then at some point down the road in life we failed. Now, everytime we try to set out for that greatness, we’re reminded over and over of those failures. He hasn’t changed His mind about you! 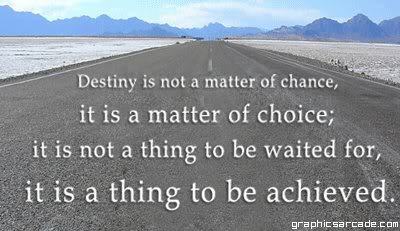 The destiny on your life can will be fulfilled if you choose it. Your failures DO NOT revoke the call of God. So the choice is in your hands. What are you waiting for? What will it be? Destiny derailed or just delayed? gosh.. this is so good! i love you stephen!